Northeast, hazy, unfiltered. These three polarizing words are used today in craft beer to describe a “style” that is causing quite a commotion within the beer scene, as the ongoing debate on whether the Northeast IPA should become an official style continues. Recently, I wrote a piece that featured several breweries outside the Northeast that were creating beers that would fall under this unofficial style. When chatting about their brews, the majority of brewers I interviewed said they wanted to shy away from using the label “Northeast.” Although many of the unfiltered hoppy beers being released these days have similar characteristics—the haze, tropical fruit notes, low bitterness—most breweries don’t view their offerings as falling under the same umbrella, as they are simply creating their own unique visions based off the beers that have influenced them the most. Regardless of what your stance is on these unfiltered hoppy suds, everyone can agree that there is something special about these brews coming out of the Northeast. In order to truly understand how this style has evolved over time, let’s look at the three waves of breweries that have helped influence this current IPA movement. For hazy brews coming out the of the Northeast, the story begins with John Kimmich, founder of The Alchemist, who was first influenced when he brewed for Greg Noonan at the Vermont Pub and Brewery during the mid-‘90s. Noonan taught Kimmich how to really embrace the haze, something that was definitely not the norm at the time. Kimmich would use what he learned from Noonan to brew his first batch of the iconic Heady Topper in 2003. “In the first two years of Heady Topper being in cans, we took a constant beating from very vocal people online. Heady was called ‘ugly’ by so many ‘experts’ that it is extra satisfying now to see the acceptance of something that people just didn’t understand. It has taken a tremendous effort to educate these people,” Kimmich mentioned to me last year. Thankfully he never gave up in his efforts otherwise many of the beers we have come to enjoy would most likely not exist today. Beer to try – Heady Topper (8% abv): Having your first Heady Topper is something many of us do not forget. I still remember sitting in the parking lot at Hunger Mountain in Montpelier during a blizzard, waiting for cans of Heady for the first time. Trying that first can was an experience I never had before; that never-ending smell of hops every time I took a sip, that dankness…it was unreal. Lucky for us, since The Alchemist opened their new location in Stowe, those parking lot lines are a thing of the past. In terms of brewers that influenced him the most, it’s his partner on list of OGs, John Kimmich. “I must have visited the (now nonexistent) Alchemist brewpub nearly every week for four years (from their opening day until I left for Denmark),” Hill recalls. “John’s hoppy beers at the pub possessed a character that I still have not again fully experienced- soft, nuanced, aromatic, distinct,” he gushes. Hill would go on to become friends with Kimmich, working hard to use the advice he and Greg Noonan provided to produce some of the industry’s favorite beers today. Beer to try – Society & Solitude #4 (8% abv): Named after Ralph Waldo Emerson, the S&S series promotes experimentation within the Double IPA style, where each number in the series represents a different beer (currently there are 10). My first beer from Hill Farmstead was actually S&S #6, which was my favorite DIPA, until I tried S&S #4. This brew is a hybrid between two of Hill’s most popular beers, Double Galaxy and Double Citra, and will blow you away with its ability to be so flavorful, yet restrained at the same time, something you won’t find with many DIPAs today. Beer to Try – Green (7.5% abv): When it comes to picking a beer to try, you really can’t go wrong with any of their pales, singles, or double IPAs, but for me, I have always been a member of Team Green, their cross-continental IPA. I picked up my first can back in 2014 (when they still had those lovely sticker labels) and was completely blown away. The reason for the name green is actually because when Tree House first brewed the beer, it had such a large amount of hops added, it appeared a greenish color. When it comes to some of the more unique unfiltered hoppy brews out there, look no further than Tired Hands. Founder and head-brewer Jean Broillet IV first decided he wanted to go the unfiltered route years ago, when he was brewing for a company that chose to filter their IPAs. “I always felt that we worked so hard to add so much to our beer, specifically the IPAs, that we then stripped out via the filtration process,” Broillet recalls. The process of finding that right combination of yeast and hops to create the something so elegant is what Jean refers to as “transcendental hop meditation.” Having been influenced by a range of beers such as Hill Farmstead’s Edward, The Alchemist’s Heady Topper, and even west-coast brews such as Sierra Nevada’s Pale Ale, Broillet has been able build a hoppy portfolio that continues to evolve and dish out new and exciting beverages. 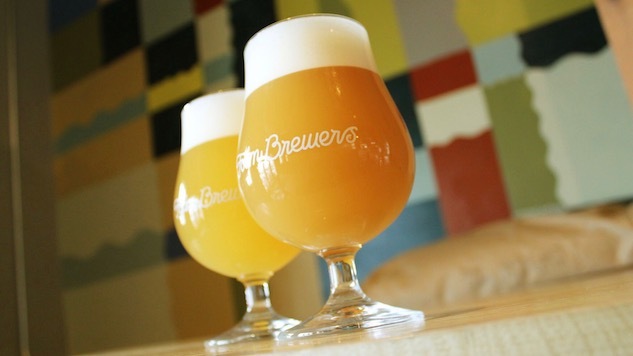 Beer to Try – Double Extra Vanilla Milkshake IPA (9.2% abv): Yes, you read that correctly, and if you haven’t had this yet, find a friend in Philly that owns a comfortable folding chair (JK … kinda). The Milkshake IPA series is a collaboration with Omnipollo that according to Broillet “sounds totally gross on paper.” For Broillet, the goal of the Milkshake series is to push the limits and get a better understanding of the Culinary IPA. When I first had this brew, I was skeptical. I actually opened it before I was leaving because I thought I would have a few sips before giving up, but instead found myself sitting there and wanting more. The vanilla gives off an aroma of sweet cream, with faint hops in the background. The mouthfeel is light and creamy, not overly thick, as expected. Instead, it’s balanced, and most importantly, enjoyable. With two locations, the original Fort Point spot in Boston, and now Canton as well, Trillium has raised the bar when it comes to accessibility without compromising quality as they have learned to dial-in their hoppy offerings even at their increased output. Today you can roll into either of Trillium’s locations and pick-up beer by the case, all without a line. However, don’t let the fact that you don’t have to plop down a chair hours before opening fool you; these are still some of the best hoppy offerings you will find in beer today. Co-founder JC Tetreault first fell in love with unfiltered hoppy beers about seven years ago when he tried Hill Farmstead’s Double Galaxy. When I spoke to JC about this experience last year, he mentioned, “it was the first time I tried a beer that featured that variety, which was unmistakably unique and incredibly intense but paradoxically delicate and balanced in comparison to the palate shredders that made up most of the DIPA offerings at the time.” While Tetreault had been working on test batches of his flagship Pale Ale during that experience, he knew right then he had to feature Galaxy hops in Trillium’s first IPA (Congress Street). Beer to Try – Vicinity (8% abv): If I’m picking my favorite Trillium beer ever, it’s Headroom, a DIPA they release once a year for Vermont’s Hop Jam. However, if you’re looking to try one of their rotating offerings go with Vicinity, a beer they originally developed for the first anniversary of a local restaurant, Row 34. Pouring opaque with lemon and orange notes on the aroma, Vicinity is a smooth brew with little to no bitterness, that’s dangerously drinkable. Beer to Try – Double Dry-Hopped Mylar Bags (8.5% abv): With the number of hoppy brews Other Half produces, it’s almost impossible to pick just one, but for me Double Dry-Hopped Mylar Bags is the one you should seek out. “Mylar was one of those beers that when we brewed it, we knew we had found our style,” Burman recalls. The beer tastes almost like a hop smoothie, and is definitely one of the standouts in their Double Dry-Hop portfolio. Beer to Try – Swish (8% abv.) or Nothing Gold (8.2% abv. ): For me there are two must tries from Bissell, and it depends on when you’re visiting. In the winter, you have to look for Swish, Noah’s first DIPA. The name actually come from a favorite show of Peter and Noah, Trailer Park Boys, in which they drink a barrel-aged moonshine called Swish. If it’s summer, you’ll have to try Nothing Gold, a beer that was on our list for top new beers of 2016. Named after a Robert Frost poem (Nothing Gold Can Stay), Noah decided to construct this brew from the ground up using a completely different hop-bill. Regardless of what season you’re there, you will not be disappointed! Beer to try – Double Dry-Hopped Tesseract (8% abv): While Grimm has always had two dry-hopped editions of beers such as Tesseract, they never thought to advertise it as such. “But we realized that it might be a useful way of labeling a beer as having cryo hops,” Joe Grimm explains, a process by which lupulin powder or pellets are flash frozen before being shattered to separate the lupulin glands from the leafy material. By using cryo hops, Grimm is able to double the quantity of hop oils with the same lbs. of hops. While at the moment cans are hard to come by (most stores have a two-can limit), that will change when the new brewery opens up in Brooklyn, allowing locals to finally welcome Grimm to the community properly. It all started on a Thanksgiving trip to Boston during their junior year of college. Captivated by the rapidly-evolving craft beer scene and intent on changing up their career paths, Matt Katase and Asa Foster decided they wanted to open a brewery. The two would take a tour of the Boston Beer Company (using fake IDs) the following day, change their majors the following year, graduate in 2012, and eventually open the Brew Gentlemen’s doors in 2014. As for their hop-forward offerings, BG began to catch the eyes of those in the beer community over the last year, and their flagship IPA finished second in our last IPA Blind Tasting. Katase and Foster give all the credit to their brewer Zach Gordon, who had been brewing these softer types of IPAs since 2010. Katase notes, “We always aim to make beers that are soft, elegant, and balanced. We’re seeing people take things to the extreme again, except now everyone is trying to make the JUICIEST instead of the most bitter.” As for the haze, Katase mentions that “it’s the result of our process to achieve these soft and balanced beers. We’re not intentionally trying to murk things up.” At the moment, BG beers are only offered in growler form, but they are working towards getting these offerings in cans sometime in the future. While there has been no shortage of excellent hoppy brews within the Big Apple, LIC Beer Project has recently become a local favorite, ever since they began pumping out canned offerings last summer. While LIC’s beers exhibit the hazy appearance that has beer nerds forming a line these days, founder and head brewer Dan Acosta notes that it’s, “funny that our beers fall into the ‘hazy’ IPA category, because ever since I’ve been brewing IPAs, even early on in my garage, it’s always been the way the beers turned out.” Having been inspired by beers such as Double Jack from Firestone Walker and Torpedo from Sierra Nevada, Acosta mentions, “it’s all process driven. I honestly believe it doesn’t matter whether or not a beer is hazy or brilliant, if the beer is well made and the overall expression of the beer is enjoyable then it doesn’t matter.” Regardless, it seems that LIC has really began to hit their stride as they continue to push the boundaries in the NYC beer scene. Beer to Try – Pile of Crowns (8.5% abv): Look to try Pile of Crowns, the beer that really first showcased what LIC was capable of. For POC, Acosta was influenced by NYC street art, as he named the brew after a piece by Keith Haring which honors one of Acosta’s favorite artists Jean-Michel Basquiat. With aromas of faint malt and berries, POC is a soft and creamy offering that provides tasting notes of peach and mango. Beer to Try – Radical ONE (8.2% abv): The ONE series began on Sand City’s first anniversary with a goal of being the best representation of how they see their craft. “In working with that idea, as we grow and change, so too did the development of that initial foundation—adding to the recipe and experimenting are metaphors for the way we approach our line-up,” Kiernan says. Two years ago, Bob Grim and Sam Keane asked to meet with their head brewer Todd Haire while working full time at Switchback Brewing Co. While Todd thought the two were putting in their two weeks, they actually were inviting Todd to join with Dani Casey and Jon Farmer to create the foundation that would become Foam Brewers. Last winter, Foam’s founders pushed through the Vermont winter, brewing every day from 7:00 pm until 3:00 am to allow contractors to work on building their brewery during the day, up until the doors opened in April of 2016. As for their hoppy offerings, being in Vermont has given Foam access to a range of hop varieties from around the world. Farmer notes, “There is no denying that Shaun Hill and John Kimmich defined the NE style IPA or Vermont IPA, whatever you prefer. Their beers were no doubt inspirational because focusing on quality and freshness is paramount for a great hoppy beer.” While their beers are offered in growlers only for the time being, Foam is working on a production facility and plan to release cans this August. Beer to try – The Fruit That Ate Itself (7.2% abv): Farmer mentions that, “when we create beer, it’s not always the beer first and then the name follows, it is usually the other way around.” And for this brew in-particular, the name came from Foam’s beer-tender, Dan O’Hara, who is a big Modest Mouse fan. Farmer notes that, “The Fruit has a lot of hop character including notes of mango, orange and pineapple so the name made sense.” The beer tastes almost like an orange cream-sicle with a bit of pine and bitterness on the backend, making for a well-balanced offering. Beer to Try – Photon (4.8% abv): While everyone will run to the DIPAs, I would go with Photon, which in my opinion is one of the best and most flavorful Pale Ales I have ever had. Peter had originally been brewing their DIPA MC^2 on his pilot system at home, under the name Strangers in the Morning, because whenever he would come into his living room each morning after taping MC^2, there would be strangers laid out on couches. “This behavior was the inspiration to brew a lighter version – Photon,” Peter explains. E=MC^2 has always been Peter’s favorite relationship in physics, so when they began to brew commercially, he brewed Photon (which is denoted as “C” in the formula) and then squared the hopping rate to develop MC^2.